Last fall, I participated in my first VHF/UHF Sprints, sponsored by the Southeastern VHF Society. I did the 2 meter, 222 MHz, 432 MHz and 6 meter sprints as a rover. The sprints were fun, but this first experience also taught me plenty about efficient roving. Most importantly, I learned that 90% of the QSOs will happen in the first 90 minutes of the four hour contest. I needed faster set-up and tear-down and better time management in moving among grids. When the time came for Spring Sprints (sponsored by the Central States VHF Society) I was a little better prepared. First, I ditched the antenna set-up I used in the fall. I don’t have pictures from those sprints, but imagine this set-up but scaled down for a single band at a time. The photo was taken during the September 2011 ARRL VHF contest. Essentially, this is the same set-up used for roving out of my airplane. The antennas were designed to be ultra portable (folding mast, removable elements) and lightweight. Its a great set-up for the plane…mediocre for the car. The set-up takes too much time, and the entire thing must be disassembled to move among grids. I first tested this system during the ARRL January 2012 VHF contest. The Sprints gave me plenty of opportunity to refine the system. One important lesson was that the built-in friction locks on the mast was not useful in this application. The antennas were difficult to align, the locks were sometimes very hard to unlock, the antenna alignment could change when the rotor torqued the mast, and finally, I was concerned about the mast becoming unlocked and telescoping down during use. The solution was to use a pair of hose clamps at each junction of the mast. The bottom clamp, on the lower section, holds an aluminum tab that loops loosely around the upper hose clamp. And the upper hose clamp is used to lock the mast into position. This set-up works much better than using (and relying on) the built-in friction locks. A nut driver is used to loosen the upper clamp. The mast section is raised and aligned and then the clamp is tightened, preventing further movement. For each Sprint, I worked four grids, beginning at about 3,200′ MSL on a ridge near Mount Rainer in CN96aw and then on to CN86xx about 2,000′ down the road. CN96aw was close enough to return briefly for a few latecomers to the spring. The two locations are close enough together that I don’t even fully take down the antennas. The next stop is CN87xa about 3.5 miles down the same road, usually in the turn-out for a gated forest road at 2,080′ MSL. This location is pretty good into the larger Seattle area, but not so good to the North, East, and South. Fortunately, most of the participants are to the West of this locale. The final location is CN97ad, about 15 miles away in the town of Buckley. The location is about 760′ MSL. It isn’t an outstanding location, but it is a new grid. In any case, by the time I get there, many people have quit participating. Last year for the 2 meter Sprint I had a single 7-element quagi pictured here and 50 watts. With a Yaesu FT-857 at 50 watts, I managed a total of 18 QSOs. That is a stack of three 2 meter homebuilt Yagis of the WA5VJB design, and a homemade phasing harness. I still used an Yaesu FT857 but augmented it with a RM Italy KL-145 amplifier for 100 watts CW and 200 watts PEP SSB. My QSO count improved to 30. The story is similar for the fall and spring 222 MHz Sprints. In fall I used a quagi seen in the foreground here. For both seasons I was limited to 50 watts on FM (223.5 MHz). In fall 2011, I got 10 QSOs. For spring 2012, with the better antenna stack and (most importantly) better time management, I managed about 24 QSOs. 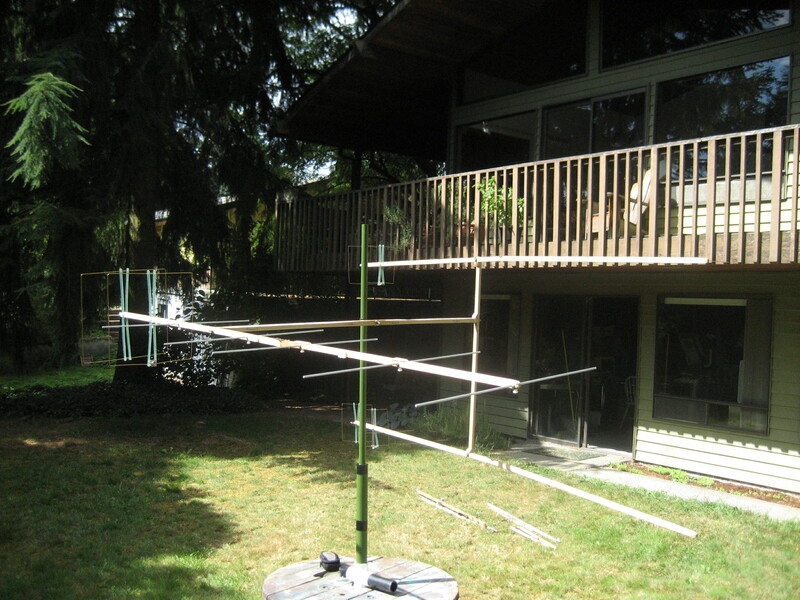 In fall 2011 432 MHz Sprint, I used a stack of two 11-element quagis (seen here). With 25 watts from the TS-857, I managed 16 QSO. And got really wet. For spring 2012 432 MHz Sprint, I forgot my camera but, you guessed it, I ran a stack of three Yagis. They were 11-element each. A few days before the Sprint I received a second-hand RF Concepts RFC4-110 100 watt amplifier that I purchased used through ebay. The amp worked quite well, except that the switchable preamplifier was DOA. The Spring 2012 432 MHz result was 28 QSOs. For the 6 meter Sprint, I ran a stack of two 3-element homebuilt Yagis. The antenna is too wide to transport legally. The outer portion of each element is removed from each side. 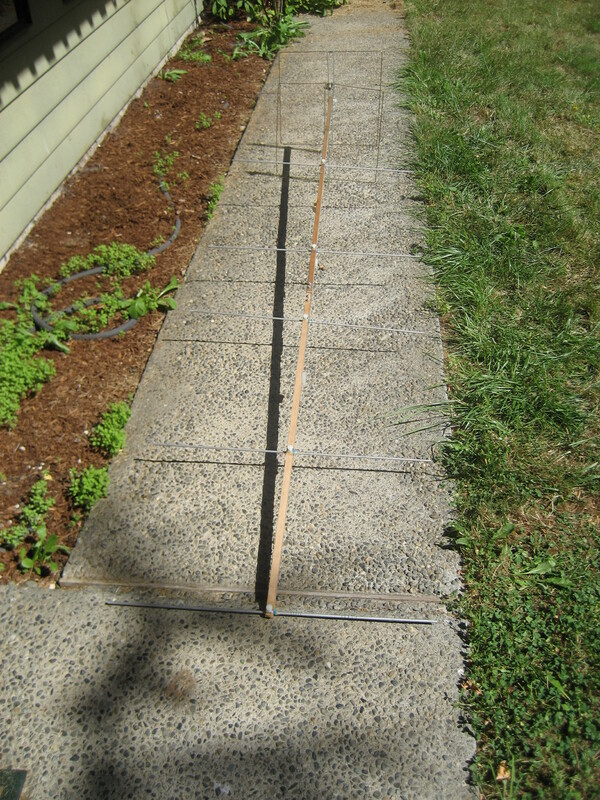 On site, they are slid back in and held with hose clamps. I used 100 watts out of a Yaesu FT-857 in fall 2011. This time I used a Kenwood TS-480SAT feeding a TE Systems 0510G 170 watt 6-meter amp, purchased on Ebay and received but a day before the sprint. It worked quite well…including the preamp. In total, I figured this set-up was worth about a 7-8 dB of gain over my set-up from last year. Did it help? For fall 2011, I made 26 QSOs and 13 unique grid-grid pairs; spring 2012 netted 57 QSO with 20 grid-grid pairs. Not too shabby! 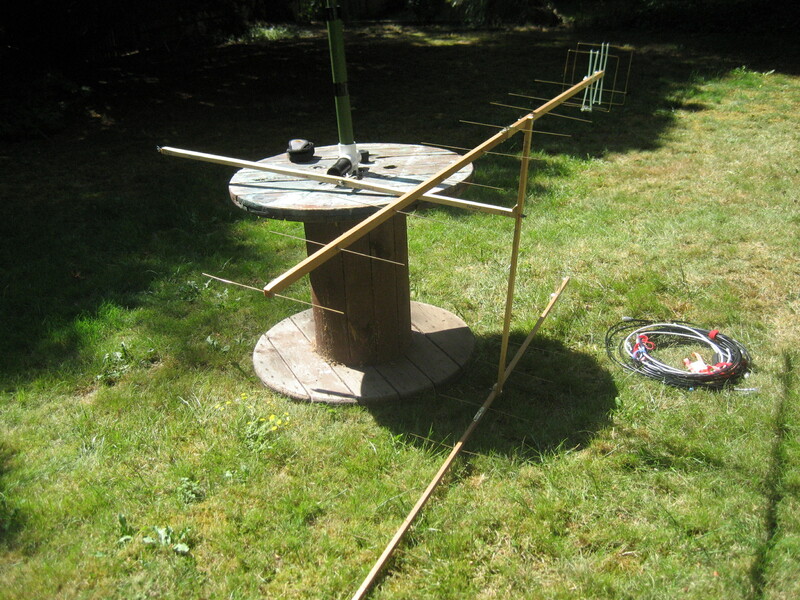 The sprints were lots of fun, and they kept me busy building antennas and phasing harnesses. The real pay-off will be in future VHF contests, where my sprint experiences will translate into higher scores. And more fun!